Today we celebrated my middle sister's Baby Shower. Lissa is due to have her first baby, a boy, in late August. I finally get to be an Aunt! While I've had baby showers thrown for me, I've yet to actually throw one myself. Since my sister does a good job of going all out for other people's celebrations, I wanted to make sure she had a fantastic shower. I did a good bit of research on Pinterest to gain ideas, and eventually started piecing the party together with my youngest sister, Jess, and my Mom. We love to throw parties, but we are not very good at the "theme" aspect. I have some great friends who really pull together a great thematic party. I am just not one of those people. Still, I feel we celebrated Melissa well. 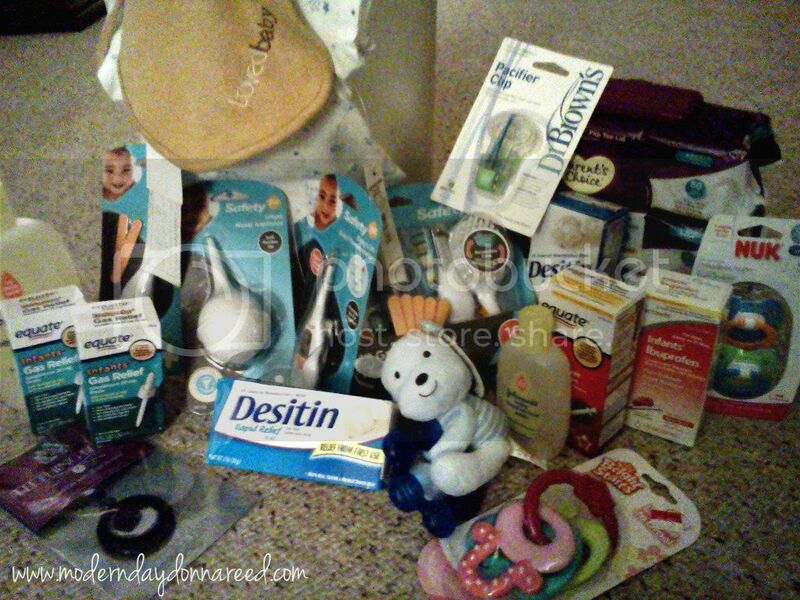 Below I've put together some Baby Shower tips and ideas. If you are attending a shower and need a gift idea, or you are throwing a shower and need a place to start on decorations, food or games, I've got you covered. There are TONS of theme ideas out there on Pinterest and other blogs, so if you can go with a theme, do it! We kept it simple, opting for blue accents, since my sister is having a boy. 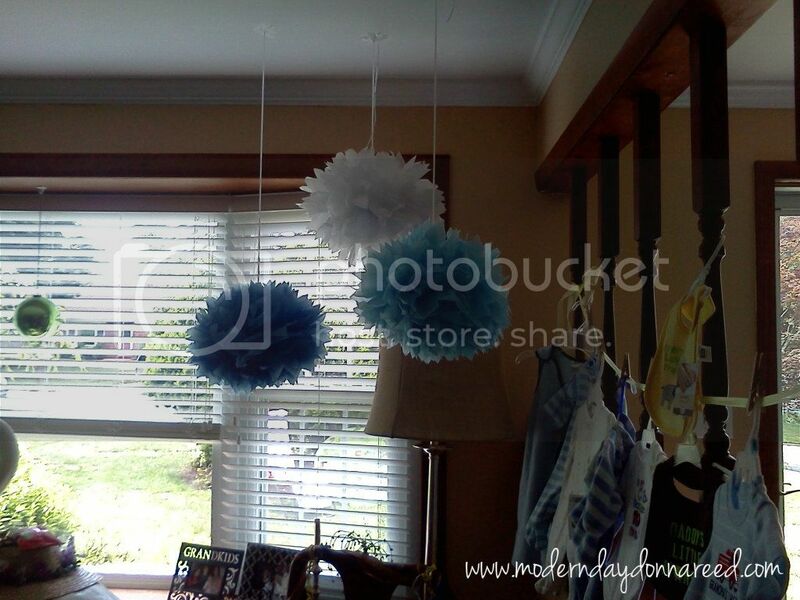 I found these cute ceiling pom-poms at a local party store. I've seen tutorials on how to make them, but was too intimidated (and time crunched). Now that I've worked with them, I think they'd be simple enough to DIY. We also showcased the baby's name. 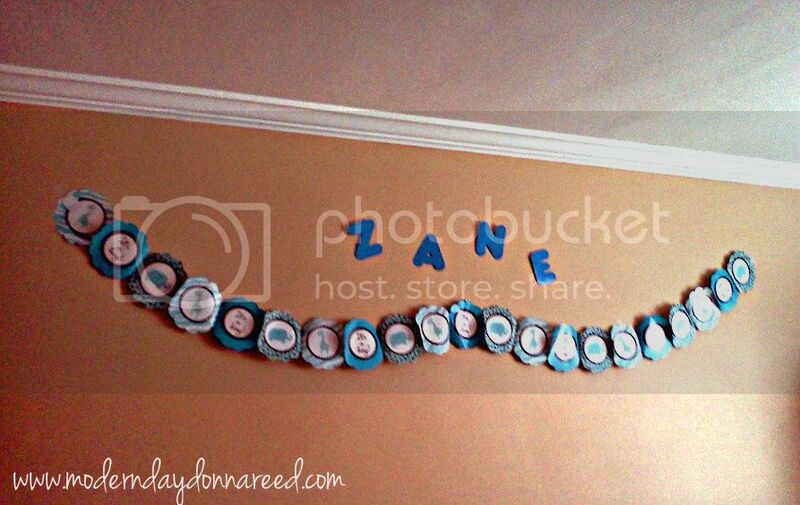 If your mama-to-be has shared the name, make it a highlight of the party! If you have a gift table or food table, glam it up by making it into a Lighted Display Table: Drape a white table cloth over the table (which should be near an electrical outlet). Plug in 1-2 strands of christmas lights, and lay them on top of the table. Place a sheer overlay fabric (just go to your local fabric store and buy a yard of pretty sheer fabric) over the lights. Viola! Super cute and classy! 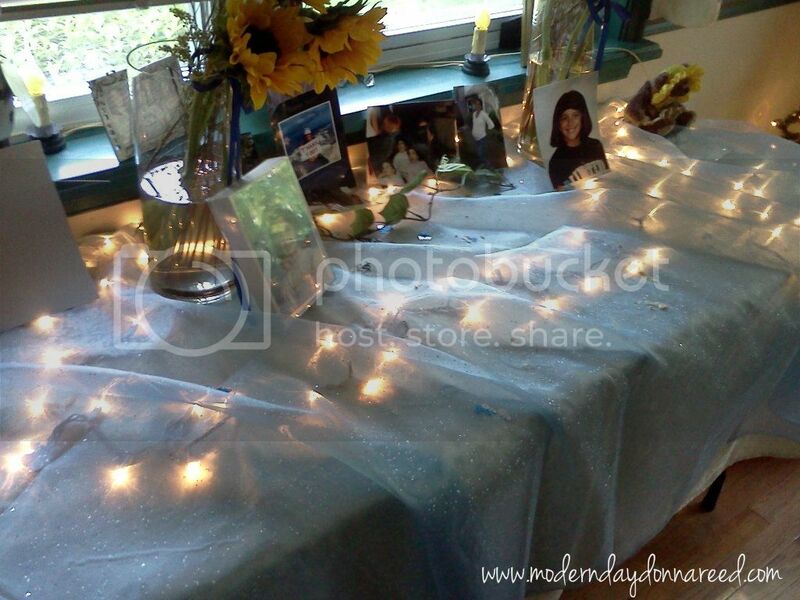 Below you can see what would become our Dessert table with a sheer blue overlay. This would also look fabulous during the holidays with a sheer red overlay! 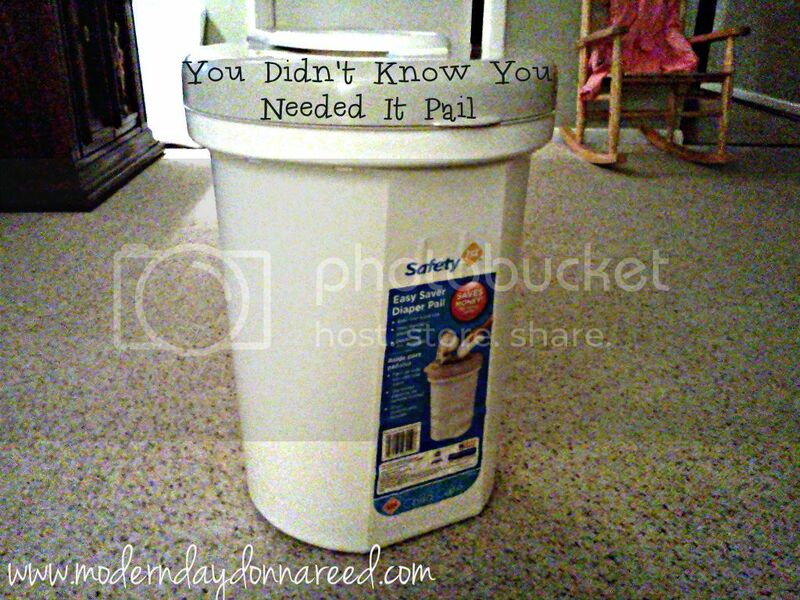 I buy a very inexpensive diaper pail (because, let's face it, you can always use an extra!). I then fill the diaper pail with all of the essentials that become part of a mom's daily life: head-to-toe baby wash, medicines [infants tylenol and ibuprofen, gas drops, gripe water, etc], diaper rash cream, saline drops, nail clippers, pacifiers, a pacifier clip, a teething necklace, wipes, newborn toys, bibs, etc etc. Games keep the party moving, so having 2 or 3 to space out over the course of the party is key. We chose to do 3: one game that people could do as they walked in, one they could do mid-way through, and one guests could do during the gift opening. And who doesn't like to win a prize?! Once again, we kept it simple but fun. 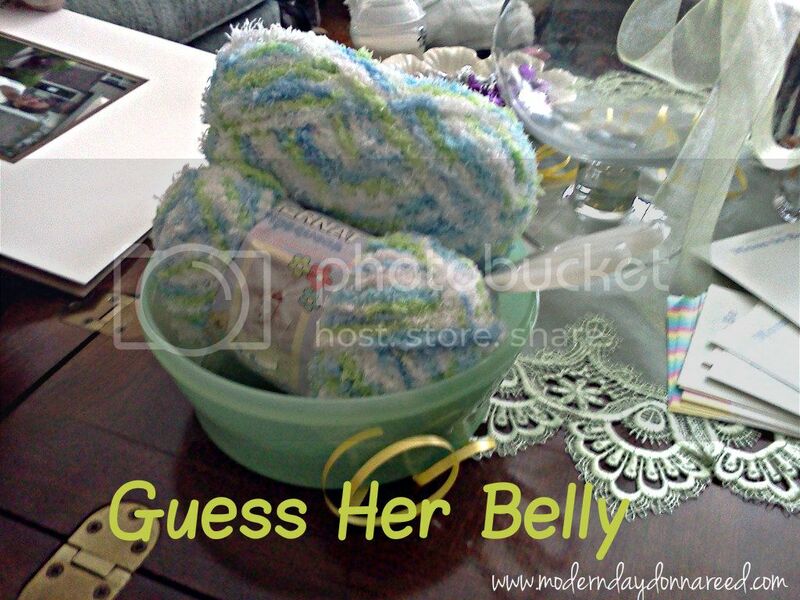 This one may seem "cruel," but if the mama-to-be is good-natured, it can be fun. Have 1-2 skeins of yarn. Guests arrive and cut a piece of yarn they think is the correct measurement of the mama-to-be's waistline. Before gifts are opened, a correct yarn measurement is taken, and the person whose piece of yarn is the closest wins! Some people thought this was gross, but I think it's awesome. I chose 6 different chocolate candy bars (Snickers, Milky Way, Kit-Kat, Hershey's, Reese's Peanut Butter Cup and Almond Joy). I melted each in a bowl, one by one. So once I melted the first chocolate bar, I spooned it into Diaper #1 (which I labeled). I melted the next chocolate bar and spooned it into Diaper #2, and so on. Guests had to write down their guesses as to what kind of candy bar each diaper held. They could sniff, taste, etc. The participant with the most correct wins! 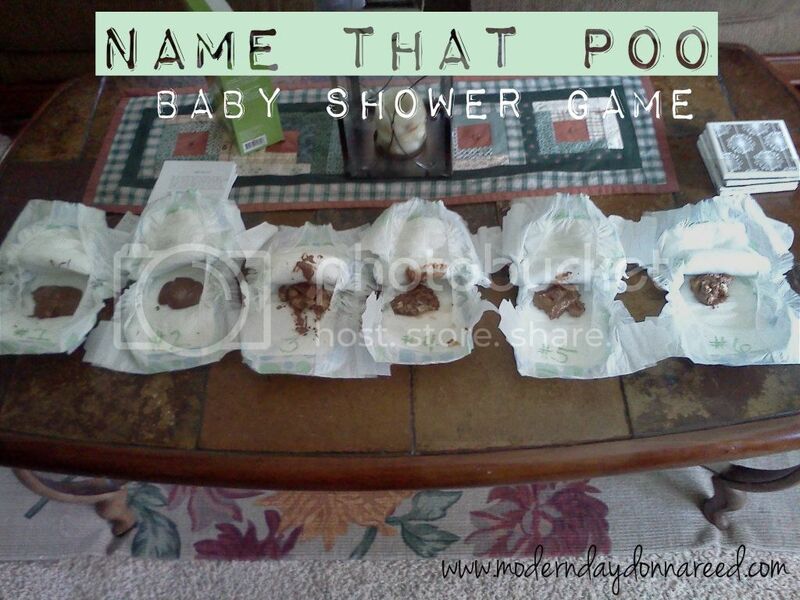 This is a classic shower game, both at bridal showers and baby showers. Guests are given a blank Bingo Board, and asked to fill out the boxes with items they think the mama-to-be (or bride-to-be) will receive. If she receives a gift they've guessed, they mark off the box. The first guest to get BINGO (or, rather, five boxes in a row) wins! If you need a Bingo Board : click on the image above, download it and print it for your next Shower! What is a party without FOOD? One thing my family knows how to do is feed people! We had a great spread of hot roast beef for sandwiches, various side dishes and scrumptious appetizers. 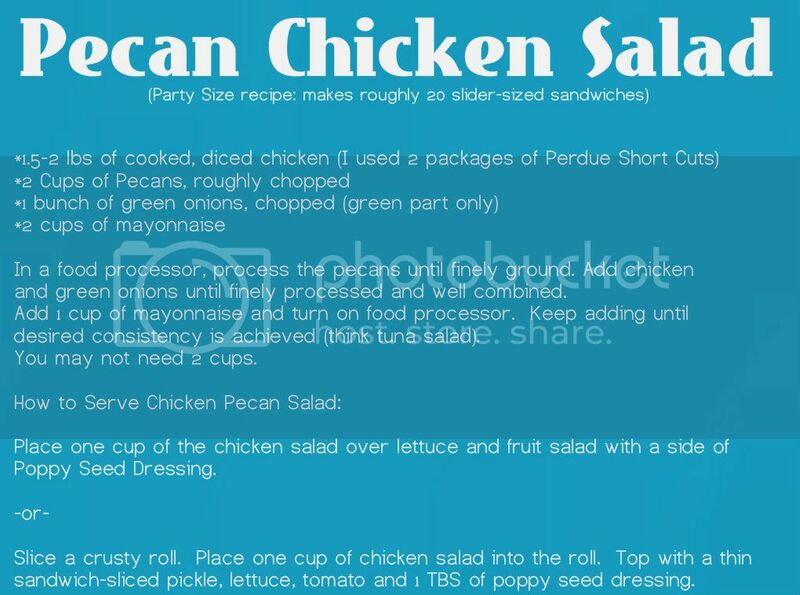 One of my contributions was my tasty Pecan Chicken Salad. I re-created this salad after repeatedly enjoying a similar salad from a local cafe. At the cafe, it is served on a bed of lettuce accompanied with a fruit salad and a side of Poppy Seed Dressing. I often make it and spoon it on a roll, top it with a pickle, lettuce and tomato for a tasty lunch. This recipe is truly a crowd pleaser! The chicken salad looks more like pate, so you may want to label it in case people confuse it for tuna. If you are making tea sandwiches ahead of time, drizzle with Poppy Seed Dressing and top with lettuce and tomato. Click on the recipe card below to download and print out a copy! 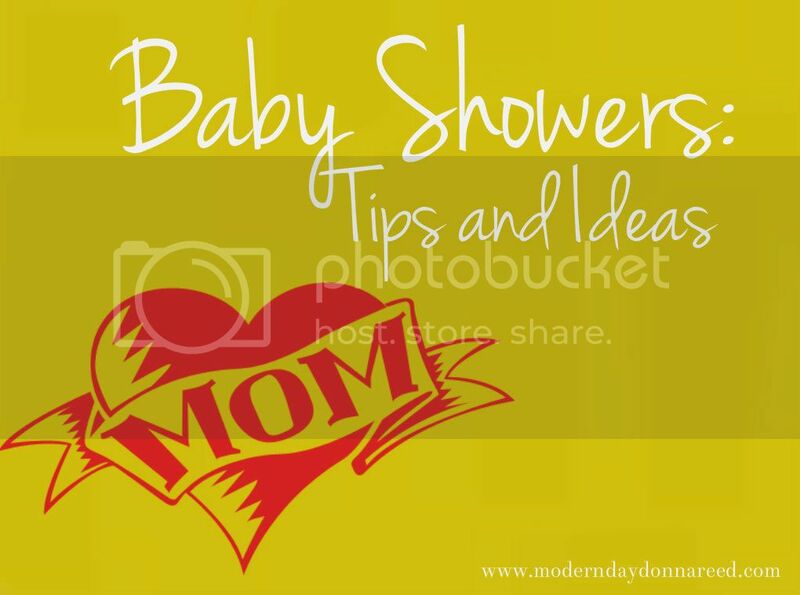 I'd love to hear your Baby Shower tips and ideas as well! So please leave a comment below with your best gift, recipe, decoration and game ideas. Congrats to you for being an aunt! And what a great idea with filling the diaper pail with goodies :) Beautiful lighted table too!